Is Nintendo's Legal Suit Helping R4 Sales? The rush in demand has been amazing. These devices always sell well. But this weekend should be staggering, don't you think? According to Amazon Japan, there's been a slight increase in sales as well. So far, this lawsuit seems to be helping more than hurting. 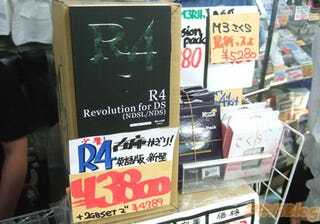 Click through the gallery for a look at Akihabara retailers selling R4s.